Merge and overwrite data which is currently held in your master list? Once your Email Thermometer template has been created, you will need to create a List. A List is a set of contacts to send the Email Thermometer to. Each contact must contain an email address as a minimum, but could also contain additional data, such as first name, last name and another 10 custom fields. This might be a List of your regular customers, your key accounts, or all of the customers who bought something from you that week. Some of our users send Blasts on a customer-by-customer basis. Some send Blasts to their entire customer base. You can type your List in by hand, or upload a List directly into the app. Click the Manage Lists tab. Click “Add a new List. 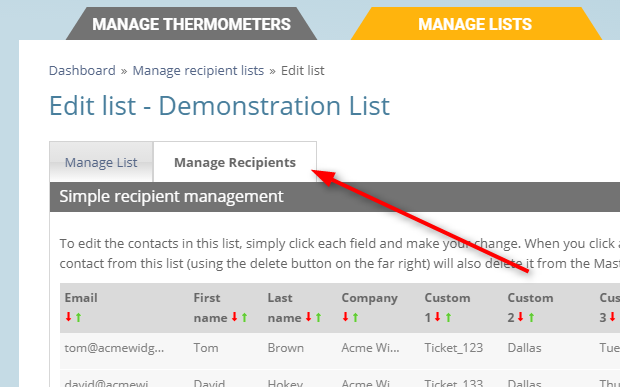 Once you’ve given your List a name and clicked ‘save’, a second tab will appear, “Manage Recipients”. All of your contact data is held in a single master List. When you upload contacts to a new List, you can choose whether to overwrite and merge your new data with the data held in your master List OR use unique data for this List only. As an example, you would choose “Yes” if contacts in your new List were duplicates, but their contact details had changed. The master List is accessible via the link in help text to the right of this section. In order to see your merged data, you will need to refresh the page, by clicking “Save List”. For small Lists, it’s a simple task to key in or paste in data into the “Add multiple recipients” box. Ensure you follow the instructions show. There’s example data below. When you click “Save List”, the contact data will be processed and be available for further editing within the “Manage Recipients” tab. A CSV file is a comma separated variable file. Excel can save as into this commonly used format. You will find an example template to download on the Create a List page. When your CSV has been created, browse for it via the last box on the page. Click “Save list” to upload it. Large Lists will be processed over the next few minutes. Smaller ones will be available immediately. You’ll see your contact data listed underneath. You can sort the data by clicking on the arrows. You can also add additional recipients manually to the List, by adding their details underneath. Click “Add Recipient when you’ve entered the data. Once you’ve uploaded your List of contacts – click the “Send a Blast” button on the main menu. Then simply select your Thermometer template, and your List. What is an Email Thermometer?